The above chart shows estimated cumulative PlayBook sales by month based on data from downloads of the free game Pixelated. Of note is the slope of the graph over the past few months. The past three months (which correspond with RIM’s financial quarter) show more PlayBooks sold over this time frame then all previous months combined. 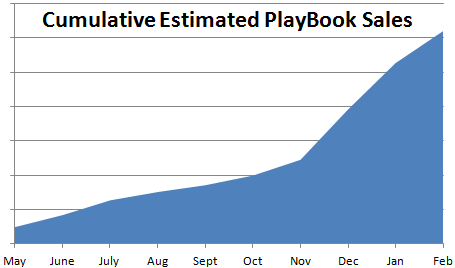 Given how lean inventory was at the end of the last quarter, I think that it is possible that RIM will announce 1M PlayBooks shipped in the past three months. It looks as if the price cut (and Christmas) has helped drive greater adoption of the PlayBook.